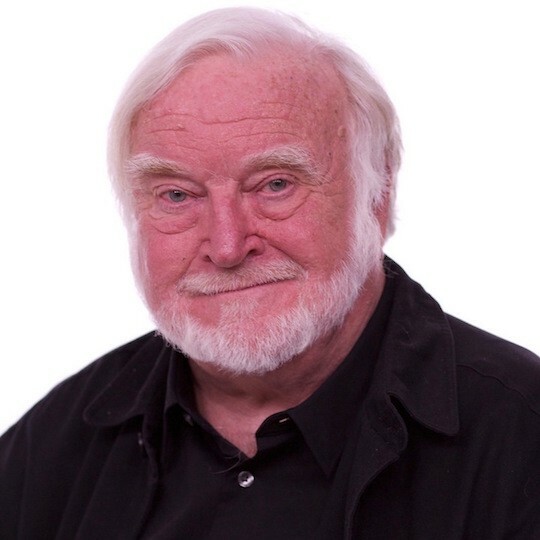 Mihály Csíkszentmihályi is a contemporary Hungarian psychologist born on Sept. 29th, 1934, in what is now Croatia. He emigrated to the United States at the age of 22, received his Ph.D. from the University of Chicago in 1965. Csíkszentmihályi came up with the concept after interviewing a variety of people at work and at play. Another term for the concept came from Arne Dietrich, is ‘transient hypofrontality’, which is to say, a temporary state of mind in which the frontal lobes of our brain are less active. The focused, thinking part of our brain gets a rest, and allows other parts and functions of our brain to become more predominant. During this time, we trade in conscious processing for subconscious processing. While in flow state, our brain releases the five most addictive neurochemicals into our brain: norepinepherine, dopamine, anandamide, serotonin, and endorphins. This causes us to perform at a state of heightened relaxation and focus, and improves our ability to learn, our creativity, and our motivation to succeed, and it is a pretty addictive feeling to experience. 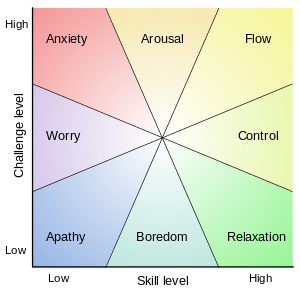 There are 17 triggers for flow state, stemming from 4 main groups: Environmental, Psychological, Social, and Creative. All of these have implications for game design, which I will explain. Serious Collaborative Concentration — being aware of teammates and opponents in a sports match. Good Communication — Collaboration and building upon everyone’s ideas. Familiarity — Unity in thoughts and in action. Risk — Just as the environmental risk mentioned above applies to individuals, this applies to groups as well, shared responsibility of potential failure. Sense of Control — Being able to choose what challenges you accept and overcome as a part of the group. Close Listening — As with Good Communication, a naturally flowing conversation in which no member is ignored. Additive, Not Argumentative, Input Only — Momentum, togetherness, and innovation from intensifying each other’s ideas and actions. This is the brain’s ability to break down existing patterns and concepts, and using them to create and link new ideas, as well as the courage to bring those new ideas to the public. The social triggers for group flow can be found in almost all collaborative and competitive team games. There isn’t much more to expand upon beyond what is said in the above section. The key to facilitating group flow within a multiplayer game is making sure your competitive matchmaking is working as well as it can be, and that the goals or destinations for every match or dungeon are clearly defined before or at the start of them. One of my favorite ways to spend a few hours in a group flow state is by playing ranked doubles matches with my brother on Rocket League. 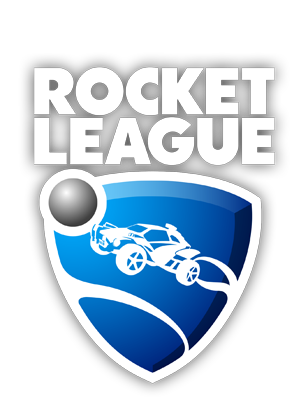 Rocket League, by Psyonix, combines the action of sports games with the speed and intensity of racing games. I achieve flow state regularly with my brother when we are working together, trying to collaboratively raise our rankings as well as our skills as players. While playing, we use Discord (a voice over IP software similar to Skype) to foster communication and calling out moment-to-moment plays to drive teamwork. We are both familiar with each other’s skill sets and work together with that in mind. There is always the risk of losing any given match, and thus de-ranking from it. We notice each other’s playstyle during the match and comment how the other can improve. Just like the social triggers to flow state, the creativity trigger is very straightforward. If you are working with a creative-focused game, implementing the ability to create functional, aesthetically pleasing designs or constructs that the player can call their own is instrumental to your player-base achieving flow state within your game. Games like Minecraft, developed by Mojang and now owned by Microsoft, or Dragon Quest Builders, by Square Enix, offer a creative outlet to a wide variety of players. 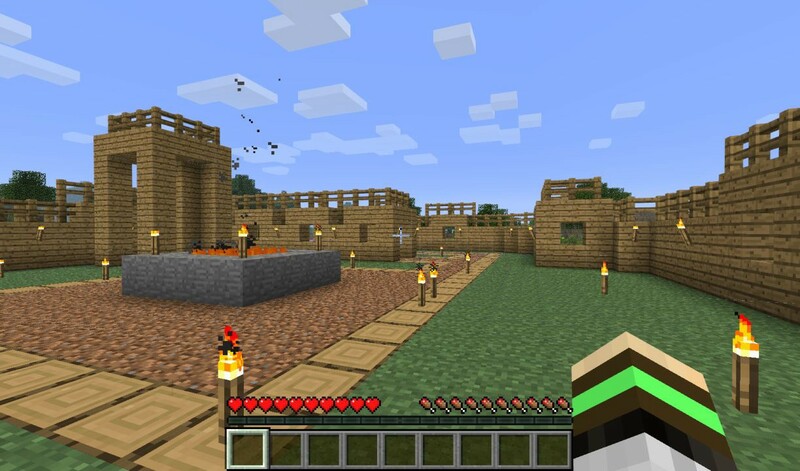 Minecraft is a more distilled form of this creativity, offering no real goals besides day-to-day survival and the networked web of achievements in game, while Dragon Quest Builders is a more objective-oriented game, blending creative gameplay with RPG elements, with more clear-cut goals of building and defending the towns while collecting resources for your citizens. The main thing to focus on in order to allow your players to stay in flow state is to cut away any unnecessary distractions and minimizing their time spent not engaged with your game. This brings us to the psychological and environmental triggers. Environmental triggers of flow state come from instituting a feeling of risk in your game as well as aesthetically pleasing level design that draws the player into your game. Deep physical awareness is pretty difficult to achieve with a video game unless you are on the cutting edge of developing for virtual reality, so we will skip that one. Risk and consequence is created by causing the player to lose something non-insignificant when they fail at a challenge, whether than be the money they were holding, some equipment or items from their inventory, or simply a loss of progress (but you should definitely implement some sort of autosave feature into your game!). While I mentioned that a pleasing world and level design is important for getting into flow state, what is equally as important in achieving that immersion is the design of a good user interface (or UI). Take Fallout 3 by Bethesda Softworks for example. 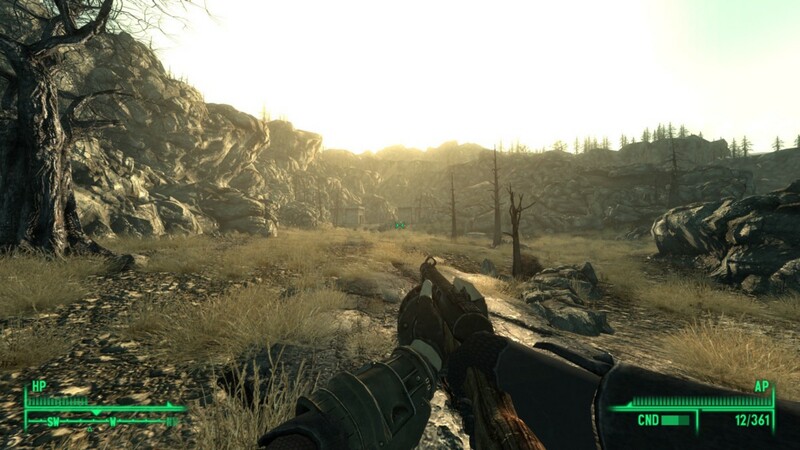 Everything that the player needs to know is located in the bottom corners of the screen- health points, action points, weapon condition and ammo, and a compass with markers for nearby objectives and enemies -with the occasional notification in the top left when entering a new area for the first time. All of this information tucked away into a spot where it won’t bother the player if they don’t need to check on it while they are exploring. Fallout 3’s concise interface, together with the wealth of small goals found in the games numerous side quests (which the player has the choice of whether or not to display as a compass objective), make for a very flow-friendly gameplay experience. Contrast this experience with that of Battleborn, one of the latest titles developed by Gearbox Software. While I will not say anything on whether or not Battleborn is fun, and though the game does implement moment-to-moment goals, colorful landscapes, and collaborative effort with other plays, the UI can get awful at times with how convoluted and in your face it gets. This screenshot from the game has been passed around as an example in terrible UI design. 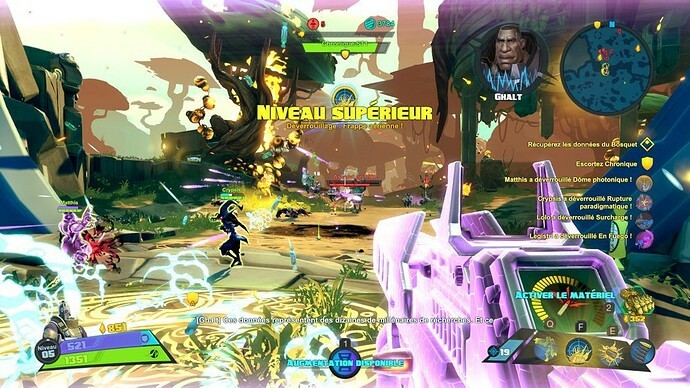 In addition to what is found in Fallout’s UI, Battleborn’s also contains an omnipresent level bar, minimap, a list of objectives for the level, health bars of all enemies and allies, your character’s abilities and resources, and the occasional subtitles, picture, and audio of story-related information being presented to the player as checkpoints are reached, which can sometimes be mid-combat. All of these cues at once take up a large amount of the screen, and will take the player out of the possibility of entering flow state. Lastly, we have the psychological triggers to flow state, which I have touched on a little throughout this article as they are hard to avoid mentioning. To reiterate, they are: singular and undivided attention, clear and precise goals, timely feedback, and a balance of skill and challenge. Each of these could have their entire articles written about them, so I will instead distill these together into one core idea. Having a singular major goal or destination for the player with smaller objectives leading up to that, removing other extraneous distractions, making sure the player feels like what they are doing is correct, and having a consistent and gradual difficulty curve that improves as the player does, are all multifaceted goals that you as a developer should strive to include into your game in order to facilitate flow state, and one of the easiest ways to help achieve that is by offering a continuous gameplay experience. What I mean by this is trying to cut down as much as possible on anything that isn’t playing the game, examples of this include loading screens, cutscenes, stopping to ask the player about purchasing DLC (downloadable content) or microtransactions, or unskippable sections of the game that dictate the pace, otherwise known as ‘auto-scrollers’. An example in which continuous gameplay is done right is found in simulation games such as The Sims 3, by Maxis, a subsidiary of Electronic Arts. While The Sims as a series is notorious for its large amounts of DLC (downloadable conent), they are never displayed in game unless the player has already purchased them, they only exist to enhance the player’s experience, without nagging the player about their availability. The only loading screens in the game exist at the very start of every play session, as the player is first booting up the game. Lastly, any time in which the player is not able to actively affect the game world, say for instance all of their sims are at work, at school, or asleep, the game enters fast forward mode and zooms into the future to a time where they can continue to give orders to their sims. The Sims 3 encourages flow state by having a largely uninterrupted gameplay loop, complete with small and large goals for the player to try to complete, as well as facilitating an environment in which the player can create their own goals, or exercise creativity in building and modifying a house for their sims. At odds with the near-continuous gameplay of the Sims, which encourages the player to think “just one more in-game day, then I’ll stop this time I swear,” you have the gameplay of Metal Gear Solid 4, by Kojima Productions, at the time a subsidiary of Konami. MGS 4 holds two Guiness World Records: longest single cut scene in a videogame, and longest cut scene sequence in a videogame, at 27 and 71 minutes long, respectively. At a total of just over 8 hours worth of cutscenes in a roughly 18 hour long game (according to averages at howlongtobeat.com), the game felt more like a movie, with the actual gameplay sequences added in as an afterthought. With the system of camouflage being made automatic, and the addition of what is essentially an iPod that lets you change the background music at any time to a song from the soundtracks of any of the previous installments, Metal Gear Solid 4 feels more like a cinematic title trying to cash in on the nostalgia of the success of its predecessors more than a game to be enjoyed on its own merits. Please note the video linked above, while 26 minutes long, features a total of about 3 minutes in which the player has control. 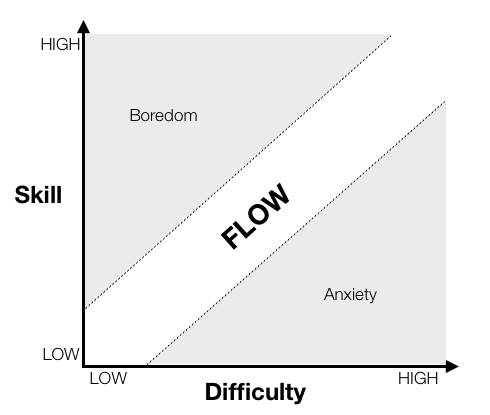 Csíkszentmihályi’s concept of flow state is more likely to happen through maintaining uninterrupted gameplay, removing unnecessary distractions, providing clear goals, and maintaining a level of risk and challenge that is proportional to the player’s expected skill level. Offering a creative outlet for the player make their experience unique to them is also a plus. But, going too far with anything extra will put your game at risk of distracting the player right back out of it. 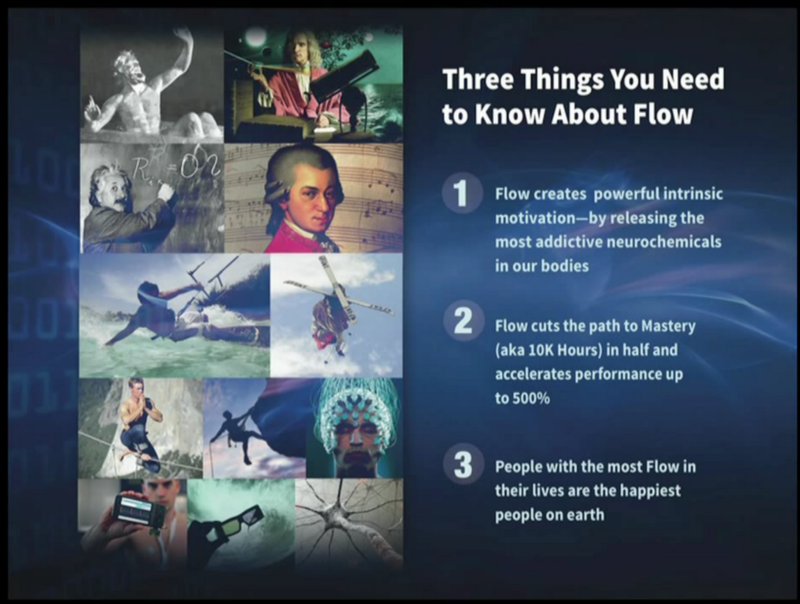 I’ve listed some more resources that can take you further into Flow state, below including this Google Talk by Steven Kotler, which we watched in one of our lectures. Passionate about video games and 3D CADD modeling, dabbles in mechanical physics and manufacturing. Tasty psychology inspired ingredients and recipes that every interactive designer needs to sample.